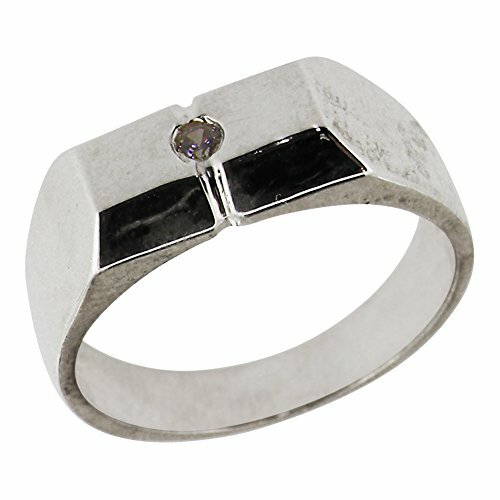 An unusual solid looking nugget style ring with a smooth polished finish and a White Diamond set within the central divide. A simple contemporary style which is easy and comfortable to wear. On the inside of the shank there is a Full British Hallmark which includes 925 (the purity mark for Sterling Silver), the Leopards head and the Royal Lion, these symbols are unique to the Assay Office in London where the fine metal content of Jewelery items has been tested since the 14th Century. The ring was Designed & Made in England, it is available in a wide range of sizes and will be sent to you in a Luxury presentation ring box.